Don't miss out on local event news, workshops, and special discounts. Sign up for YogaOttawa Newsletter now. Partner Yoga is practiced with a partner, and focuses on integrating your practice through physical contact. Partner Yoga can help develop your communication skills, your ability to be honest, and your capacity to observe and understand body language. This style of yoga will vary depending on the teacher’s experience and training. Help support your local yoga community by adding a link to the YogaOttawa directory from your website, links page, friends� page, resource page, blog or social network. While we do our best to keep all of the listings relevant and up to date, we suggest that you contact the studio directly to ensure the class you are planning to attend is still scheduled. 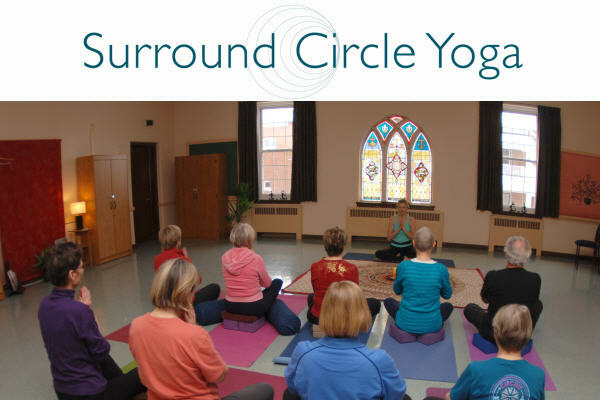 Surround Circle Yoga is a delightful place to practice and receive the healing benefits of YOGA! Our classes are small enough for individual attention and diverse enough for all levels of fitness and abilities. New students are always welcome. A wide variety of classes are available on a drop-in basis. First class is $10.00 and thereafter you can choose to buy a class card or pay-as-you-go. Seniors & Students receive 10% discount. A private introductory yoga lesson might just make the difference between sitting on the fence and jumping in with both feet! What are you waiting for? Call for a free consultation. Include your Ottawa yoga studio, centre or class on yogaottawa today in 3 quick steps.